If you want to step back in time while also getting a taste of the great outdoors, this vintage 1920s cabin is just for you. 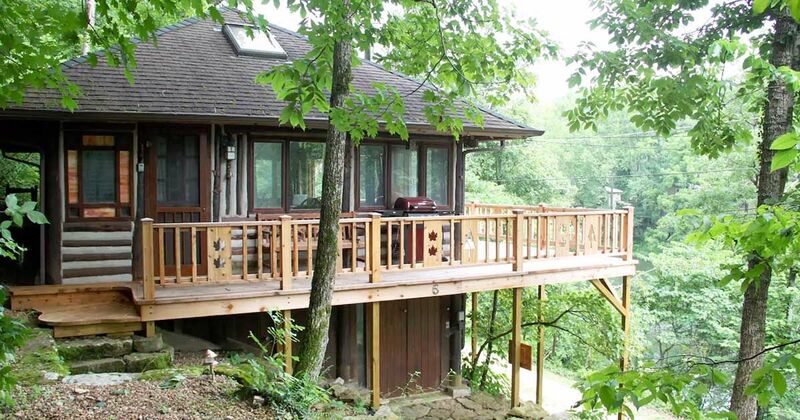 Tucked away in the Ozark Mountains of Eureka Springs, Arkansas, this quiet retreat is actually going to surprise you with its amenities. Your jaw will drop just looking at that incredible wrap around porch - but the massive windows and incredible tub inside are really going to sell you on this space. The floor plan is open and casual - so grab a book, your favorite bottle of wine, and imagine a relaxing weekend away here. You won't want to miss it! 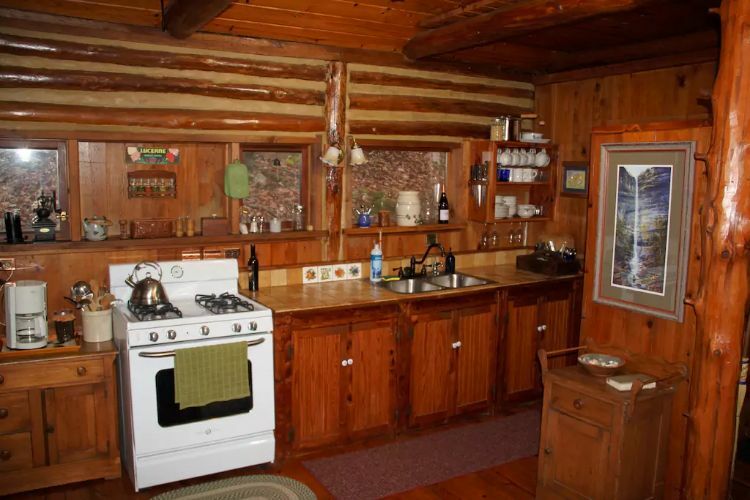 The kitchen is lined with an incredible array of wooden cabinets, paneled walls, and log beams. The rich color and age of the wood make this room stand out - and really make you fall in love with the vintage, cabin feel. The kitchen opens up into this large living space that's completely surrounded by windows. So whether you're tucked in the corner in that vintage armchair or sitting on the couch next to the fireplace you always have a view of the great outdoors. 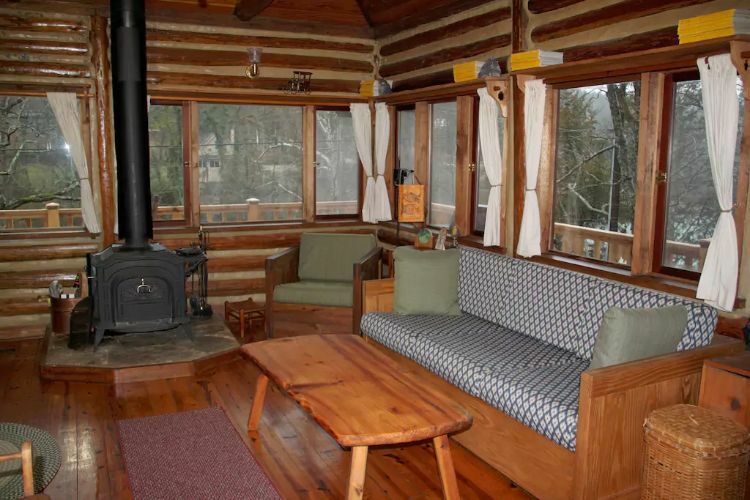 The master retreat is in the back of the home - cozily nestled up against the logwood frame. You can sit in bed in the morning and admire the wildlife right outside your window - no need to adventure out into the cold! 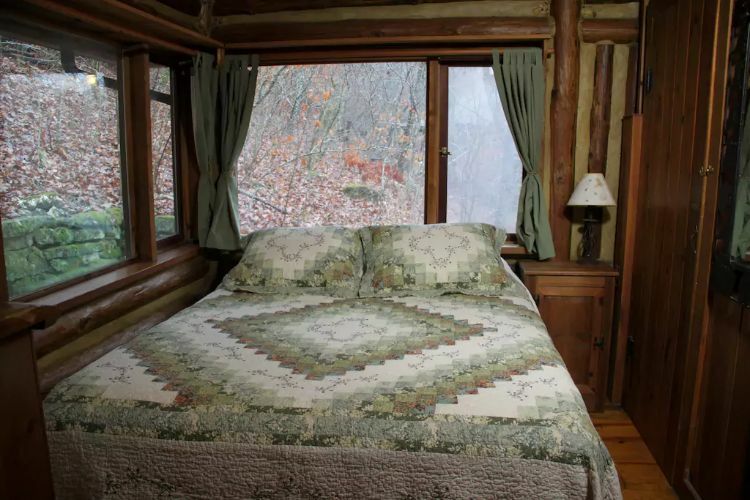 The most unique part of this cabin is the clawfoot tub that's open to the living room and boasts incredible views of the forest just outside. 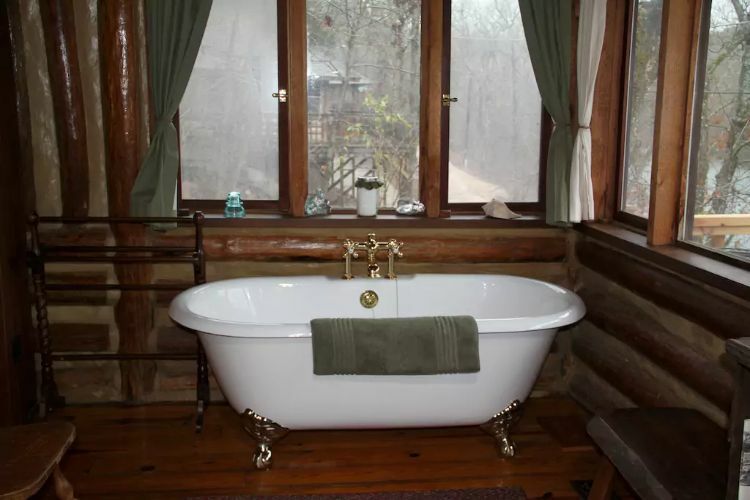 This tub is a real romantic addition to the cabin - and we have to say we just adore the idea. After a long day of hiking and exploring, all you'll be thinking about is drawing a bubble bath here and relaxing. Then there's the wraparound porch. From here you have a one of a kind view of Lake Lucerne - a spring fed lake - and the surrounding Ozark mountains.